Although it’s a room that usually escapes decoration at Christmas the kitchen is still under a lot of pressure to perform. Added ingredients along with special crockery and extra guests means the kitchen has to hold a lot more than at any other time of the year. This is when storage matters, as you need a clutter free workspace when entertaining guests, while you need extra room for all the festive treats. There are now very quirky ways to enhance your storage in the kitchen. Even the smallest kitchen can find an extra 20% storage space with a little imagination and some quirky storage solutions. We often think of storage as shelves, boxes and drawers, storing our items horizontally. This does of course make sense but when the horizontal space runs out, where do you go next? 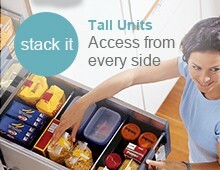 There is a lot of underutilised space vertically in a kitchen, from the backs of unit doors to the walls. You can free up a lot of space by adding shallow shelves or hooks to the insides of the doors, storing smaller items such as herbs or condiments, rolling pins or utensils. Most pans and utensils now have holes so they can be hooked on a wall or from a cleaning. A ceiling rack can free up a lot of space, keeping many items out of the way yet still easily accessible with an outstretched arm. This method of storage doesn’t look untidy either, it adds character to a kitchen and stops you having to bend to rummage through cupboards to find the pans and utensils you need. Many people forget about the space on top of their kitchen units too. This isn’t the most convenient area to store items (unless you’re very tall) but it can provide space for those kitchen gadgets you rarely use. 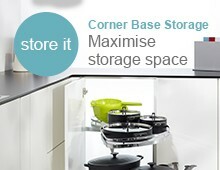 There’s a place in every modern kitchen that is often overlooked yet is ideal for storage, as long as it’s clean. 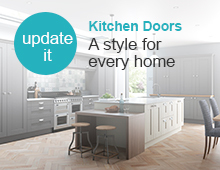 Behind the kickboards in your kitchen you have oodles of space just waiting to be utilised. Most kickboards are easily removable, they have to be in case of leaks. Before you do utilise this space though make sure you clean it thoroughly as it is one place that generally escapes the mop. 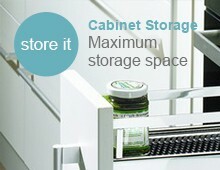 It’s not ideal for storing items you use daily but it is great for those you use rarely. You can store an extra fold up chair or two for when you have guests, cookbooks you rarely read and spare crockery or utensils. It’s not recommended to store food here though as it is directly on the floor and as there are holes in the wall for sink drainage, it could attract pests. Under the sink is a space not often utilised due to the inconvenience of the u bend. 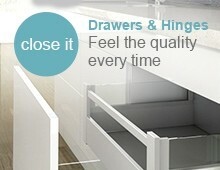 There is quite a lot of wasted space in the upper area of this cupboard that can be used easily with an extendable rod. A tension rod will stop extending when it reaches a solid surface and provides a great bar for hanging cleaning products from. 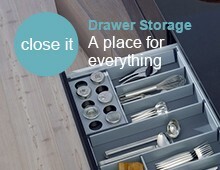 If your budget is a little bigger you can invest in some nifty storage solutions from Blum that make the most of every bit of space your kitchen has.